Hormones coordinate growth. They send a message from one part of a plant to another, to tell cells to do something. For example, a seedling leans towards the light. This happens because the hormone auxin is sent from the tip, down the shade side of the stem which elongates the cells on that side. Seedlings lean towards the light. 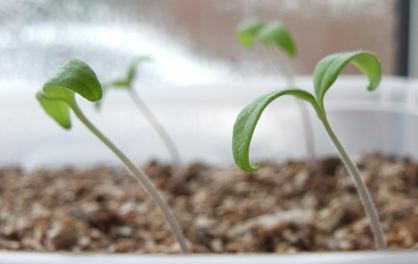 Because the cells are elongated on the shade side of the stem, and not the light side of the stem, the seedling leans or bends towards the light. Auxin is also used to promote rooting activity so it’s the stuff gardeners use when taking cuttings by dipping the stem in the rooting powder or gel. I contacted the makers of Rootit rooting gel to ask about the hormone levels in their gel. They said that their rooting gel contains less hormone than is in the plant already – that’s good! Auxin also helps when grafting too! Last week we looked at the hormone auxin and how it is used to make seedlings lean towards light. This week it’s abscisic acid and ethylene. When soil moisture runs very low, plants become stressed and send a stress hormone called abscisic acid to their guards cells to close (see stomata and guard cells). This helps conserve moisture in a plant’s system. Tomato plants are easily stressed – especially when moisture levels are up and down like a yoyo. Keeping moisture levels in the soil within a reasonable range is a real challenge when growing in containers as most of us will testify. 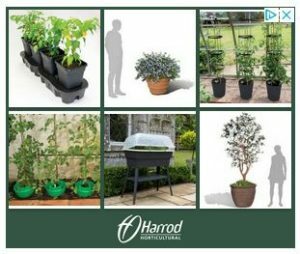 Stress can cause all sorts of problems in tomato plants and it’s very difficult to avoid stress when growing outside in variable conditions. Perhaps the most well known plant hormone is ethylene. This is a gas that triggers fruit to ripen. We often use a ripe banana in a bowl or bag of unripe tomatoes helps the ripening process. This hormone (or group of hormones) causes the internode of a stem (distance between sets of leaves) to elongate and cell division to occur. Gibberellin is made in the stems, roots and young leaves. Elongation of the internodes is a characteristic in tomato plants that isn’t helpful because it can reduce the number of trusses on a tall variety before it reaches the greenhouse roof! If a plant doesn’t receive enough light, it will also grow tall and leggy with greater distance between leaf sets (internodes) than normal. In this case, the hormone plays it’s role to help the plant search for light above. To keep plants from becoming leggy in low light conditions, reduce temperature and especially moisture in the growing medium. Gibberellins are often used on commercially grown dessert grapes so that the stems attached to the grapes are longer and give more room for the grapes to grow, causing them to be bigger. The tomato variety Shirley has short internodes as one of its natural characteristics and is therefore one of its advantages. 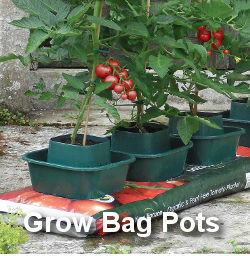 Anti-gibberellins are used to prevent commercial crops such as bedding plants grown in glasshouses from becoming leggy. Hormones that are used to manipulate plant growth are called Plant Growth Regulators – PGR’s.